While most people likely just set up their GMail on their BlackBerry directly, Google does offer their own native app for accessing GMail on BlackBerry smartphones. Adam, I know used to use it a lot but as Phil over at Android Central noticed -- Google has now deprecated the GMail app for BlackBerry. Yes, you can still get GMail on your BlackBerry -- this is strictly the app, that you download that will no longer be supported not GMail through your BIS account. Beginning November 22, 2011, we will end support for the Gmail App for Blackberry (installed native app). Over this past year, we've focused efforts onbuilding a great Gmail experience in the mobile browser and will continue investing in this area. Sounds rather harsh right? While it may seem like a shot at BlackBerry, it's more a push for people to use Googles web services considering BlackBerry devices now support HTML5 better through the BlackBerry web browser. 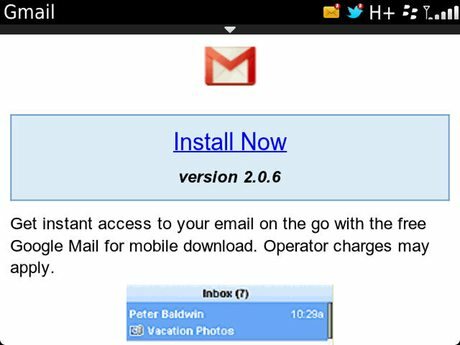 The current GMail app for BlackBerry is based off the 'old' look of GMail so there is still room for Google to revamp it. They've done it with the most recent GMail for iOS -- but that thus far hasn't worked out so well either since it launched on iOS essentially broken. Of course, you can't forget the Android factor either which arguably offers the best GMail app experience on a mobile device so while it may not be a direct shot at RIM, its a clear sign they want you aware of Android.